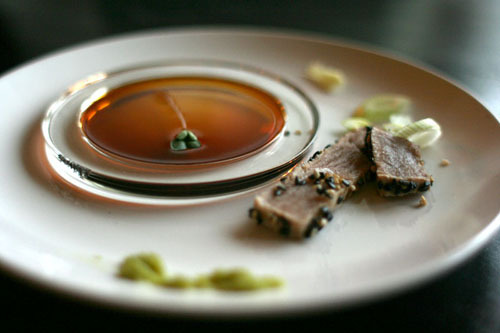 I made Tuna, cooked with the tataki methood. And instead of having the typical glass of white wine i always have with sushi I tried a new thing. I bought a bottle of Beaujolais and a bottle of Cava. Cava and champagne is really good with sushi. I am not much of a sparkling wine fan, but the sushi really made the wine interesting and vice versa. The Beaujolais went very well with the sushi and the soy sauce, I recommend trying both the Beaujolais and Cava next time you make sushi. Put a bit of salt and pepper on the steak. Sear it on a dry hot non stick pan, about 10-15 seconds each side. Put it in a bowl filled with ice cold water for 10-20 seconds to stop the cooking. Cover with sesame seeds on both sides, put in a aluminium and put in the freezer for an hour or more. You can lightly roast the seeds on a hot dry pan. Slice it really thin and serve with soy, wasabi and ginger, bit of spring onion and I put a radish micro green in the soy for extra presentation.